The party was AMAZING and I can’t wait to show you guys pictures of it! I am as tired as I can remember being, so while I recuperate, I have one last guest poster for you. I am super excited to introduce you folks to Estee Lavitt. Estee is a working mommy who manages to find time to bake and cook delicious food, and she maintains a blog. Also, she is the nicest person on the entire twitter. No jokes. Are you impressed yet? I know I am. Wait, there’s more! Estee bakes the best challah ever. I know so because I tasted it. That’s the awesome thing about meeting online friends in real life, you get to taste their goodies! Estee is pretty lucky too, if I do say so myself, because her husband and I work together, and occasionally he acts as a messenger, bringing her some of my goodies. Lucky lady, isn’t she? 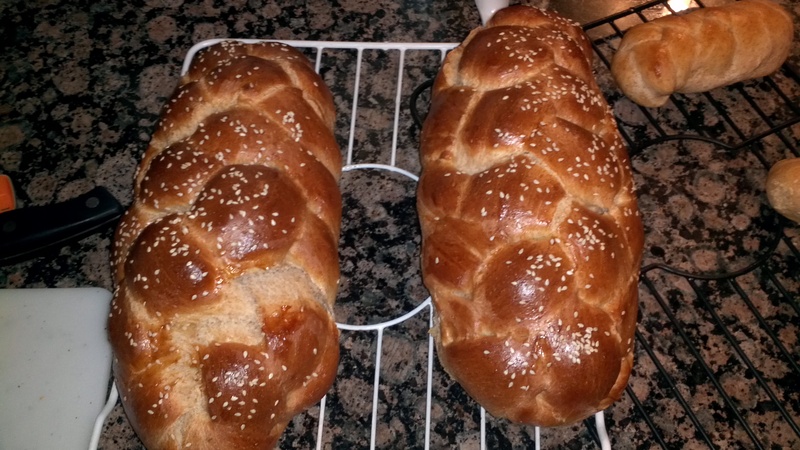 Let’s bring in Estee and her amazing challah recipe! I have long admired Miriam’s energy for cooking, baking, experimentation with ingredients and recipes, and love for learning key photography tips to beautifully display her food. Before a holiday or big bash, I make sure to bounce my menu ideas around and rely on Miriam’s expertise in this regard. (I hope she publishes my accolades!) [I love accolades! -M] I discuss ideas with her via Twitter or Facebook, and stay ahead of her blog posts. I’ve taste tested several of her finished products (find my favorite here) and have made many of her tried and true recipes. I constantly refer to the site for new ideas and low fat alternatives. Okay, and desserts! As you can imagine, I was thrilled to have Miriam test one of my personal recipes. One night I made fresh challah rolls and convinced Miriam to taste them and share them with her family. The reviews were a success and so I am proud to share the recipe with you. The recipe has evolved over the years since I began making it. Some improvements were on purpose, while others were by mistake! Doubling the amount of honey by accident was one of the best things that ever happened to this challah! The recipe can be made with all whole wheat flour, half whole wheat and half bread flour, or entirely of bread flour. I have made it by hand and in the bread machine (see details on my blog). I prefer to use white whole wheat flour and I have recently discovered the benefits of sifting the flour! It really adds a fluffiness rarely attributed to whole wheat anything. I prefer the King James brand of whole wheat flour as it is finely ground and easy to sift. Dissolve yeast in water in a large bowl. Add honey and let stand 2 minutes. Add oil, eggs and salt and mix well. Gradually add flour, 2 cups at a time, mixing after each addition. (I use a 2 cup sifter and sift as I add each batch.) Use floured hands to knead well for approx 8 minutes. Dough should be pliable, not sticky. Let rise in a greased bowl until doubled in size, approximately 1 hour. Punch down and separate challah without a blessing. Shape into 4-5 small loaves or as desired. Let rise again until doubled in size. Brush with egg and sprinkle with seeds as desired. Bake at 350° for 35-40 minutes, 35 if you like it “doughy” but not raw and 40 if you like it fully cooked through. Personally, I bake it for 38 minutes. Remove from pans and let cool on a wire rack. 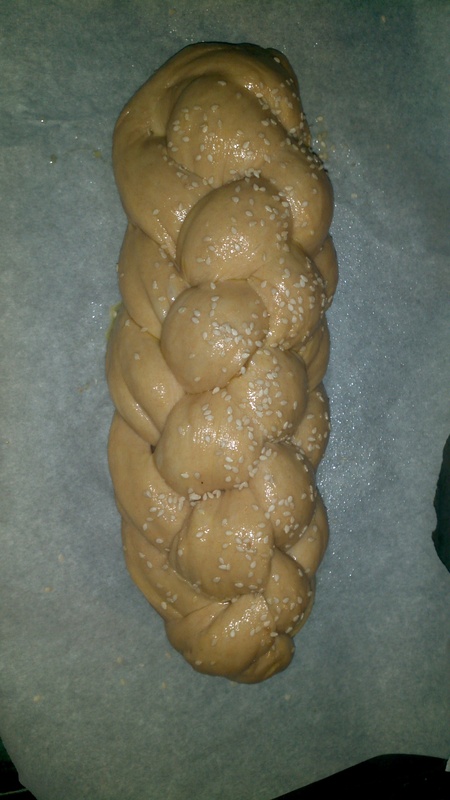 I have served this challah to countless guests and they have all complimented me on it. I’ve served it up with chocolate chips and covered in a sugar cinnamon coating. I’ve shaped it in all kinds of fun permutations. Even my children can handle the dough easily. 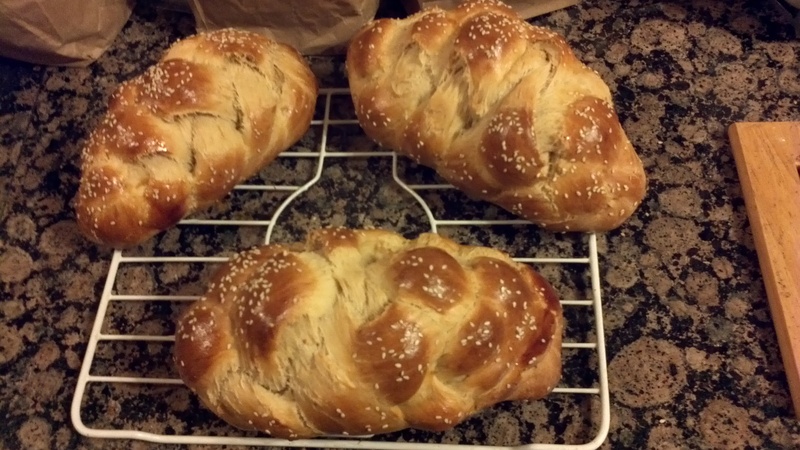 I have several friends who make the same challah and have also received compliments. It really enhances my Shabbos and I hope it does the same for you. I look forward to hearing your comments and impressions after you taste it yourself. Thank you Miriam for the opportunity to guest post on your blog. Now can you please take professional pictures of my challah? Follow me on twitter @esteelavitt or on my blog esteelavitt.blogspot.com. Thank you Estee! Send me some challah and I will photograph it for you! 😉 Thank you everyone for stopping by, and come back next week for some more of my recipes…finally! Your challah looks picture perfect! I just discovered the awesomeness of white whole wheat flour but I never sift the flour. That’s a great tip for amazing results! i like the look of that whole wheat! will have to try it sometime. Is this a 6 braid? Was there ever an answer about the conversions for 5 pounds of flour?